A look at faculty and student governance related to diversity and inclusion at Chapman. 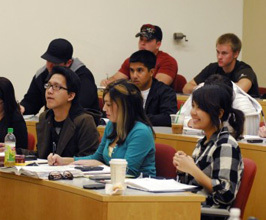 Course syllabus statements related to diversity and inclusion. Read Chapman University's Diversity & Inclusion statement here. Explore some of the strategic initiatives related to diversity and inclusion at Chapman University. 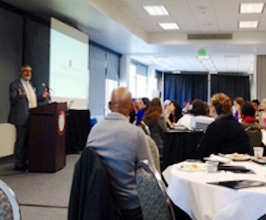 Sponsored by the Office of the Provost, endeavors to bring students, staff, faculty, administrators and trustees together for meaningful dialogue focused on developing strategic priorities and recommendations for diversity and inclusion at Chapman. 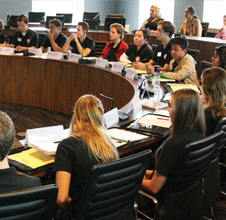 Learn about governance at Chapman related to diversity. 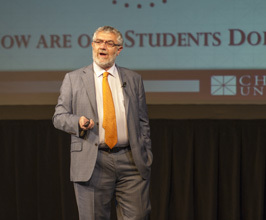 The goals of the Diversity Infusion Project in the coming year are to expand faculty participation and increase an awareness and understanding of how infusing diversity into all courses, regardless of discipline, can positively affect student learning. The Chapman Latinx Staff and Faculty forum aims to provide support to Latinx students, staff and faculty by developing connections and building a bridge between students, parents, alumni, community organizations and the Chapman community. These statements are required in all course syllabi. If they are missing from a syllabus for a course you are taking, contact your faculty member and let them know. The Faculty & Staff Safe Space Workshop is an educational intervention designed to support all members of the LGBTQIA (lesbian, gay, bisexual, trans*, queer/questioning, intersex, asexual, and all underrepresented sexual, gender, and/or romantic identities) campus community. All of the recommendations, goals, initiatives, and progress contained within this plan have been developed to reflect the core values of the Chapman University Mission Statement and the Chapman University Statement on Diversity & Inclusion.